The first and most important step in cam maintenance is inspection. Inspect your cams frequently. If you have any reason to doubt the integrity of a camming unit (or any of your gear) heed your instincts and retire it. 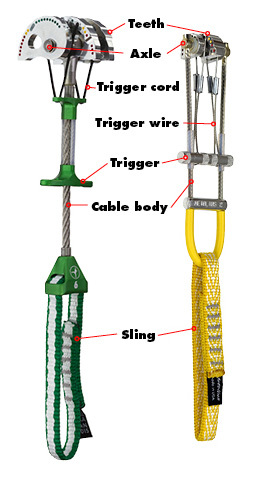 If it is a Metolius product, you can send it to us for inspection. You should destroy retired gear to prevent any chance of future use. Look at the teeth on your cams. If they are worn unevenly or have been flattened in a hard fall, it probably means that the cam has lost its shape and is unsafe to use. Check for slop between the cams and the axle. There should be some free-play, but too much play indicates that the axle holes in the cams have become oval. Compare the free-play to a new cam of the same size to get an idea of how much is acceptable. Inspect the cable body carefully. It is okay to tweak the cable to straighten it after a fall, but if any of the wire strands that make up the cable have been broken or severely kinked, the unit needs to be retired. Look at the springs and cam stops, which can break if the unit is improperly placed and then loaded. Also take a look at the axle. It's possible to bend the axle of a small unit in a hard fall, in which case it needs to be retired. The most likely places to find damage to your units are the trigger wires or the sling. Straighten the trigger wires if they become bent. Try to get the wires completely straight so all the cams lobes retract at the same rate. The cam lobes should line up evenly when fully retracted or fully open. Keep an eye on the swaged joint on the trigger wire. It is the most likely place for the wire to fray. On Master Cams and Supercams, look for cuts or abrasions on the trigger cords. If you can see the Kevlar core, it's time to replace the cords. Replace the slings if you see any signs of damage (cuts, abrasion, broken stitching or discoloration), after a severe fall or after five years. Even though your cam slings may show no significant signs of wear, the nylon will deteriorate with the passage of time. Metolius will replace slings or trigger wires on our cams for a nominal fee. We don't offer repair kits for the triggers because we like to get damaged or worn cams back in-house for a thorough inspection. Care of your cams is a simple process. Keep them clean and dry. If they get wet, don't just throw them in the closet until the next trip. Dry them off and re-lube them as soon as possible. If they get corroded, you can use steel wool or a Scotch Brite pad to remove the corrosion. Keep your cams away from any corrosive substances or solvents. Acids are exceptionally bad for cam slings and other nylon climbing equipment. Even fumes from a car battery can reduce the strength of your slings by as much as 90%. If your cams come into contact with any corrosive substances or solvents, have the slings replaced immediately. If you have any doubt, contact us to see if the corrosive substance could have compromised the metal parts of the unit. Store your cams in a cool, dry place away from U.V. light sources. To clean your cams, heat water in a pan until it is near the boiling point. Swish the heads in the hot water while working the trigger bar, being very careful not to burn yourself. Apply liquid dish washing detergent directly to the cam head, and then use a stiff-bristled brush to clean thoroughly all around the head, especially in the springs and inside the cam lobes. The Metolius M-16 brush is perfect for this task, but a toothbrush also works well. Depending upon how dirty your cams are and what lubricants you have used in the past, they may require several cleanings to work all the dirt and old lube out from the axle. Using compressed air to blow the cams out while still wet can help. Dry the cams thoroughly before lubricating. No amount of lube will restore good action to a dirty cam, so make sure your cams are cleaned thoroughly. For lubricating your cams, we recommend Metolius Cam Lube because it is self-cleaning and waterproof after it has dried completely. When dirt attaches itself to the fully dried film, small particles of the lube will break away, carrying dirt with it. MCL keeps cams working smoothly and helps them last longer. Graphite lubricants like Lock-Ease and oil-based lubes like WD40 or Tri-Flow also work, however oil-based lubricants attract and hold dirt particles so they aren't recommended for dry, dusty environments. Shake Metolius Cam Lube vigorously, at room temperature, to mix all solids. (Use body heat to warm MCL if used in colder outdoor climates.) Apply MCL (or whatever lube you're using) to the cam pivots and springs and work it in until the smooth action is fully restored. Wipe off excess lube with a rag then let MCL fully dry (several minutes to an hour). For optimum penetration, apply MCL to cams at or above 40°F (5°C). MCL can be applied to wet parts, but it will take longer to dry before becoming a waterproof, dirt-repelling shield. Sea-cliff climbing presents an added challenge to keeping your cams working smoothly. The high-strength aluminum alloy used in cam lobes is very susceptible to salt water corrosion. In this harsh environment, the steel parts will also corrode, even if they are stainless steel. Before sea-cliff climbing, make sure your cams are well lubricated. After climbing, clean your cams thoroughly in fresh water, dry them with a towel, and re-lubricate. Another thing to keep in mind is that all carabiners, as well as some harness buckles and nuts are made of the same high-strength aluminum alloy as cam lobes, and are very susceptible to saltwater corrosion. Be sure to give them a thorough rinse in fresh water after each outing to the sea cliffs, especially in tropical environments. Hot, humid climates accelerate the corrosion process. If you do not completely understand any of the above or if you have questions, contact Metolius at (541) 382-7585 or info@metoliusclimbing.com.